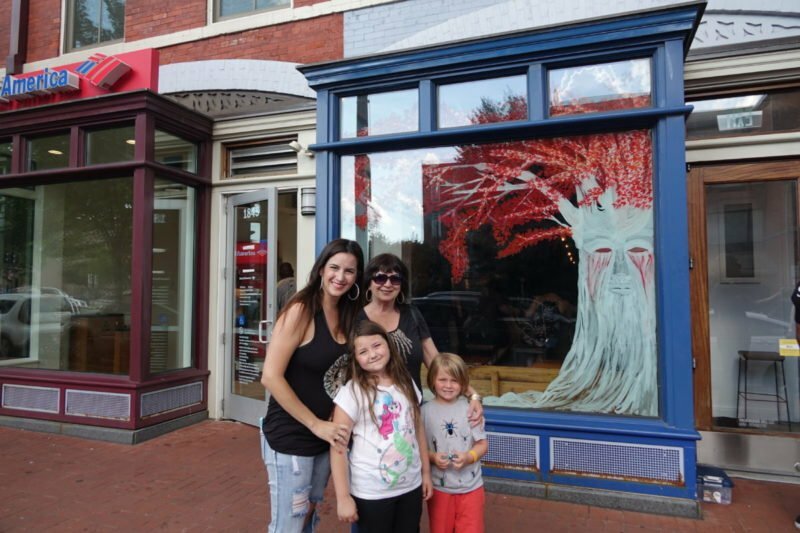 UPDATE: The GOT PUB in DC was a temporary fixture in Summer 2017, but it is likely to pup up elsewhere leading up to next season. 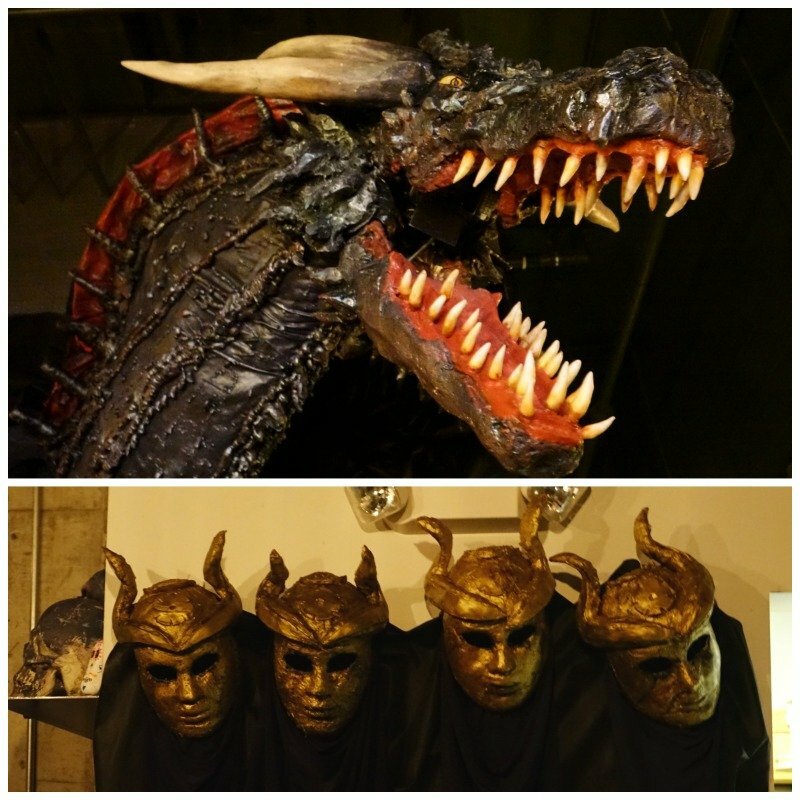 This article is still fun to see what to expect for the next Game of Thrones Pop Up Bar (PUB). It’s almost here!! Can you hardly stand it? The premier of season 7 of Game of Thrones is almost here! It has been a long wait; especially for those who didn’t just binge watch all 6 previous seasons and the excitement is in the air. So what is one to do with all this built up anticipation? Head to Washington D.C and get yourself a drink at the Game of Thrones Popup Bar. Yes, I said Game of Thrones bar! It truly exists and you know I just had to see it for myself. However, I am a traveling mama and never go far without my little nuggets in tow. Luckily for me, despite the fact that the show is not exactly kid-friendly, the bar actually is, and we were all invited to come check it out. 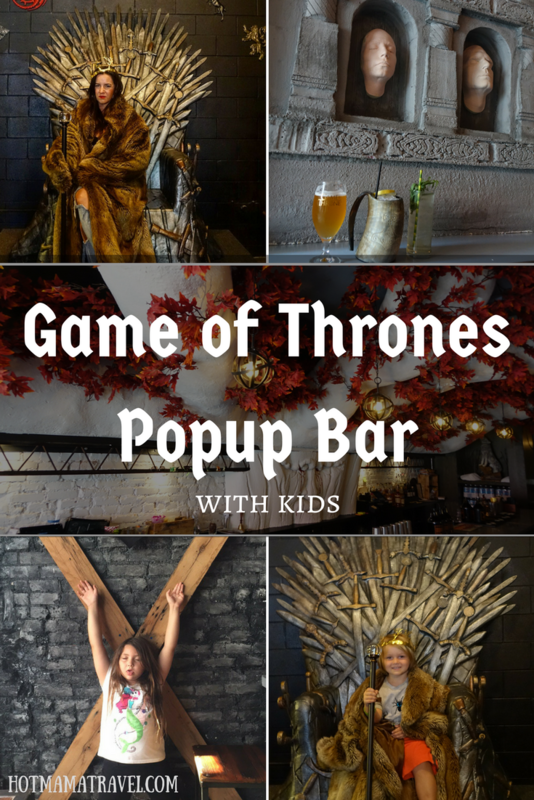 So without further adieu, let me tell you all about my night at the Game of Thrones Popup Bar with kids! Okay let’s be honest, Sunday nights are not as anticipated by the kids as they are for HotDaddy and I. For them it is a night mama and daddy can’t wait to get them to bed, make some cocktails and get their Game of Thrones on. So, when I told them we were going to the Game of Thrones Popup Bar I didn’t expect them to be as excited as I was, but they were ecstatic. CuddleBear was keen on seeing the dragon and FireCracker had her eye on the throne. I was just thrilled to see everything while sipping some cocktails surrounded by the seven kingdoms. 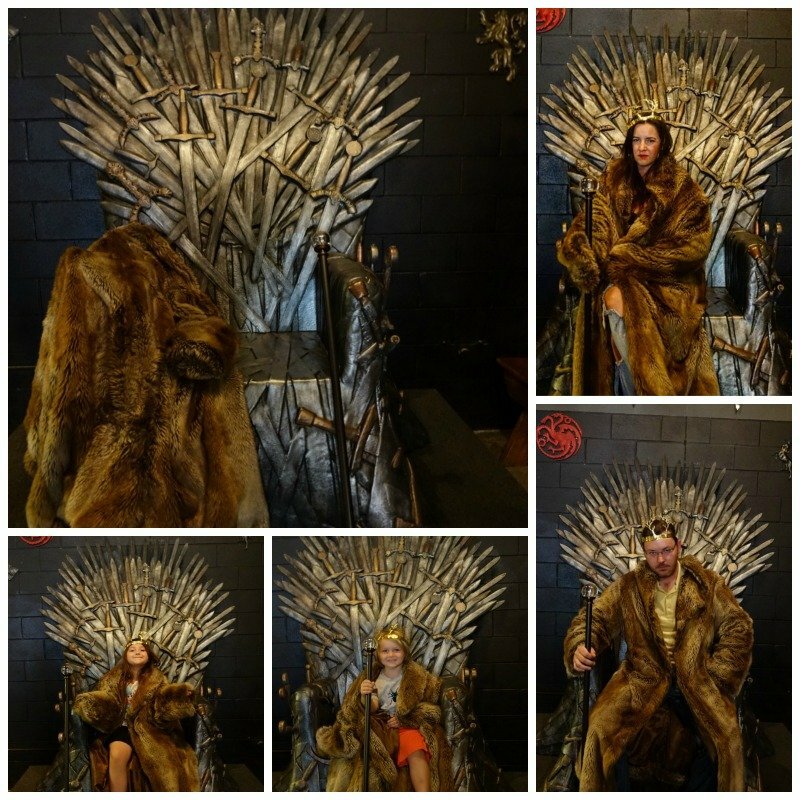 Created by Drink Company, the Game of Thrones Popup Bar takes visitors through infamous scenes as they move through the 3,000 square feet of Game of Thrones heaven. 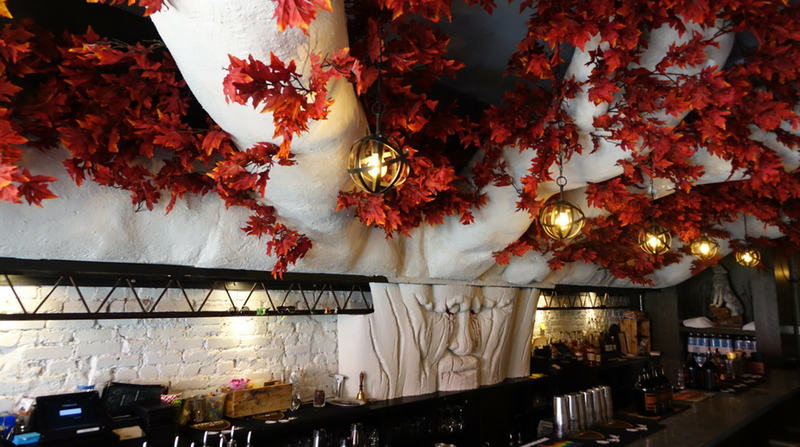 Upon entering, we were greeted with the giant Weirwood Tree blooming beautifully over the bar. Straight ahead is the room of dragons, where Drogon is busting through the wall spitting flames of fury. Actually, it is illuminated smoke, but still very cool. CuddleBear was in awe. What I loved was the Sons of the Harpy masks hanging creepily behind the bar. Moving through to the next room on the right, you have now entered the House of Black and White. 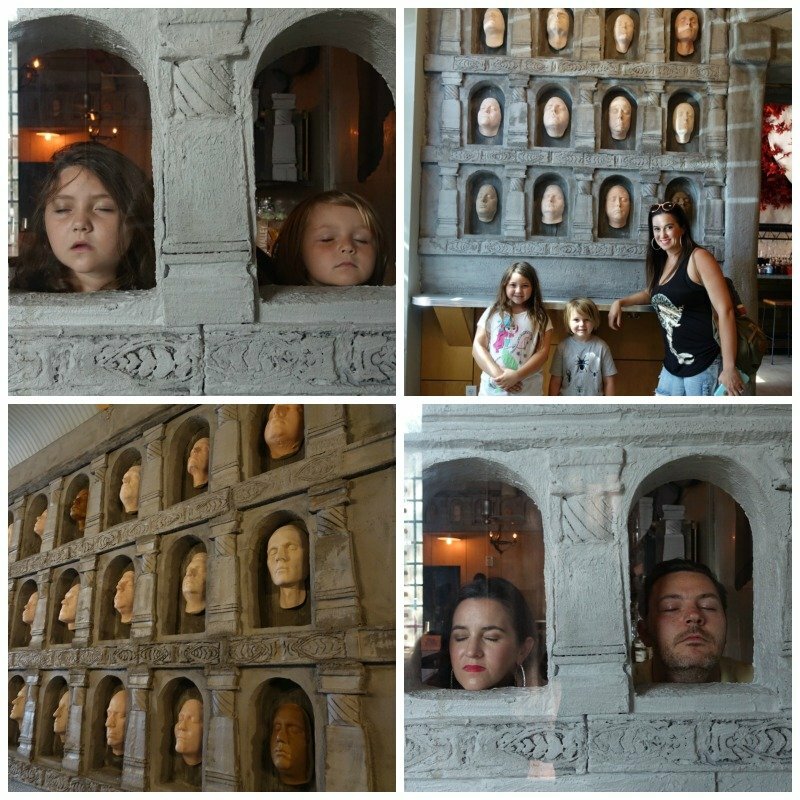 Molds of the staff and their friends and family grace the walls just like the Hall of Faces, making for one fantastic photo opportunity. There is even a spot to add your face to the wall if you so choose. I mean why not? The Girl has no name, but she does have cocktails! Next enter the throne room where, yes, sits the iron throne. Oh it is a sight! Feel free to put on a fur coat and crown as you sit upon the iron throne, because in the game of thrones you either win or you die. We all took our turn on the throne and I have to be honest, it felt good…real good. (No, I wasn’t constipated; I was trying my best Cersei face). With the haunting theme song blaring through the speakers and all the houses’ coats of arms hanging on the wall of the fourth bar, you just can’t help but get in the spirit of things. FireCracker even hopped at the chance to pose as a flayed person. Like I said, it’s totally kids friendly. 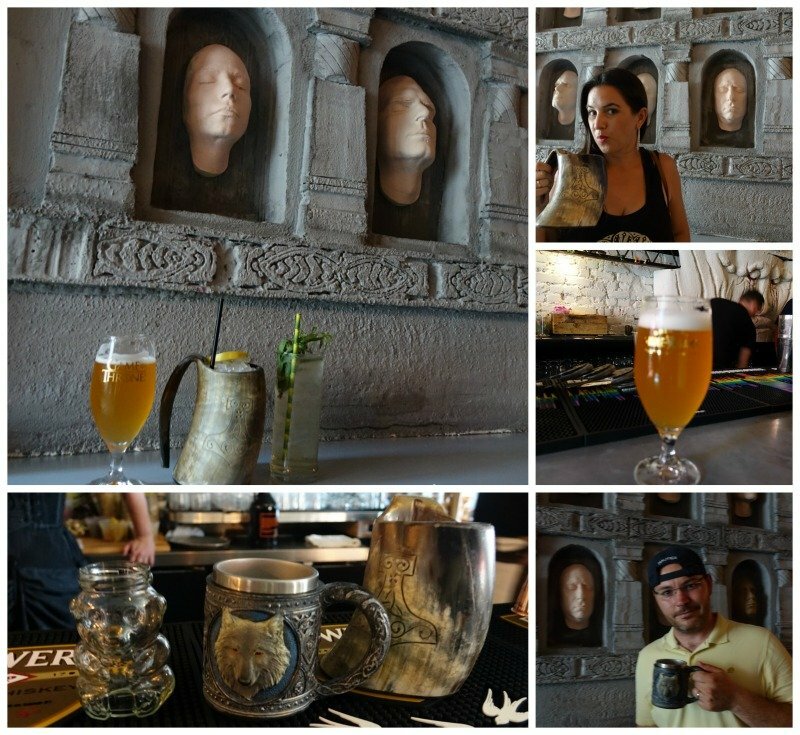 Speaking of getting in the spirit, The Game of Thrones bar has plenty liquid delights. Each cocktail is crafted to represent the characters of the show. Not only are the ingredients of the cocktails as unique as the wild characters, so are the glassware and garnishes. 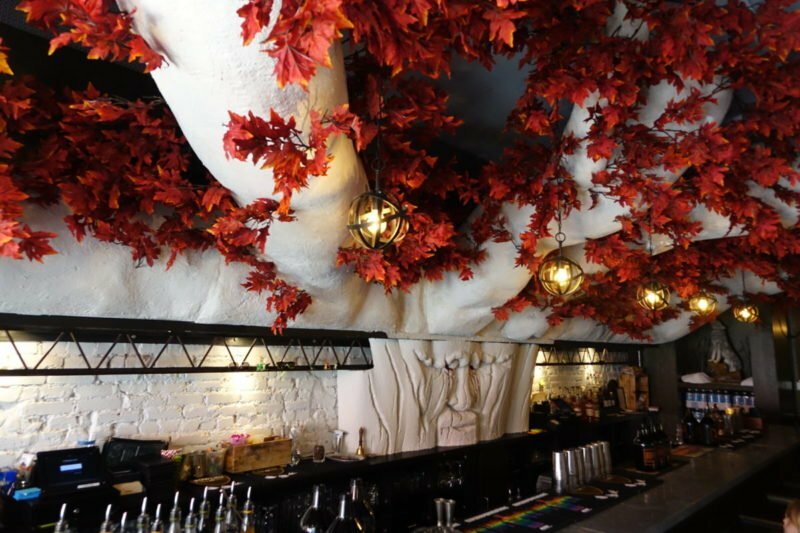 Every detail is thought of at the Game of Thrones bar. For instance, HotDaddy enjoyed The North Remembers, a mix of Scotch, Oloroso, Cointreau, Falernum, Coconut and Pineapple Gomme, served in a large ale horn etched with the signature wolf representative of House Stark. I sipped on What is Dead May Never Die which was a refreshing version of a gin and tonic made with Green Hat Gin, Fino Sherry, Shrub District Celery Shrub, Cane Sugar, Celery Bitters and Sparkling water, garnished with herbs reminiscent of seaweed lurking around the Grayjoy’s Iron Islands. Grams is a beer lady and went for the Game of Thrones official brew, Ommegang Bend the Knee, a golden ale served in a beautiful glass goblet bearing the Game of Thrones insignia. The list goes on and on from the Lady Mormont, served in a cute bear, to The Imps Delight. I loved how every time someone ordered Shame, all the bartenders (who are in full costume by the way) chant “shame, shame, shame.” I wanted to try them all, but that would be shameful. Ha. For a full list of their themed cocktails, click HERE. What were the kids doing while we were getting our drink on in the House of Black and White you ask? The kids were treated to green snowballs as they played with the sweet little dragons gifted to them by one of the handsome unsullied bartenders. The dragons are actually a garnish for the Dracarys cocktail. In fact, the kids had such a good time that they even asked if they could start watching Game of Thrones, prompting the bar to erupt in laughter. This bar is legit and worth the hype if you are a fan of the show. The great part for me was that the kids were allowed until 11:00pm, making it possible to enjoy for traveling families like us. I may not be able to watch the show with my kids, but I could enjoy the bar with them. If you plan on visiting hurry up, because the bar will not last forever and by the end of the summer Game of Thrones Popup Bar will be gone. As a fair warning, the queue to enter gets really long, up to a three hour wait. The bar opens at 5:00pm Monday through Saturday and 1:00pm on Sundays. I suggest getting in line about an hour before it opens for faster entry. So what are you waiting for? Get in line and get a drink GOT style. What cocktail would like to try? Any GOT theories you’d like to share? Prev Story Hotel Spotlight: Family review of Best Western Plus Sunset Suites Riverwalk in San Antonio Next Story Should You Quit Your Job to Travel? Ah this place is really cool! Looks like a fun place for families like yourself, that enjoy the Game of Thrones. Now, if 11 pm doesn’t become regular bedtime, life will be good, right? Ha right. We all had a great time, but bedtime remains the same haha. Game of Thrones i love it. When we visited Dubrovnik we hit up some sites amazing. I would love to do some location travels. this looks so fun!! Where in DC is it? Here is the address. 1839-1843 7th St. NW, Washington, DC, 20001 Definitely check it out! The Game of Thrones Pop up bar really looks like a lot of fun. It is great that the bar is Kid friendly and I am sure the kids loved the place. 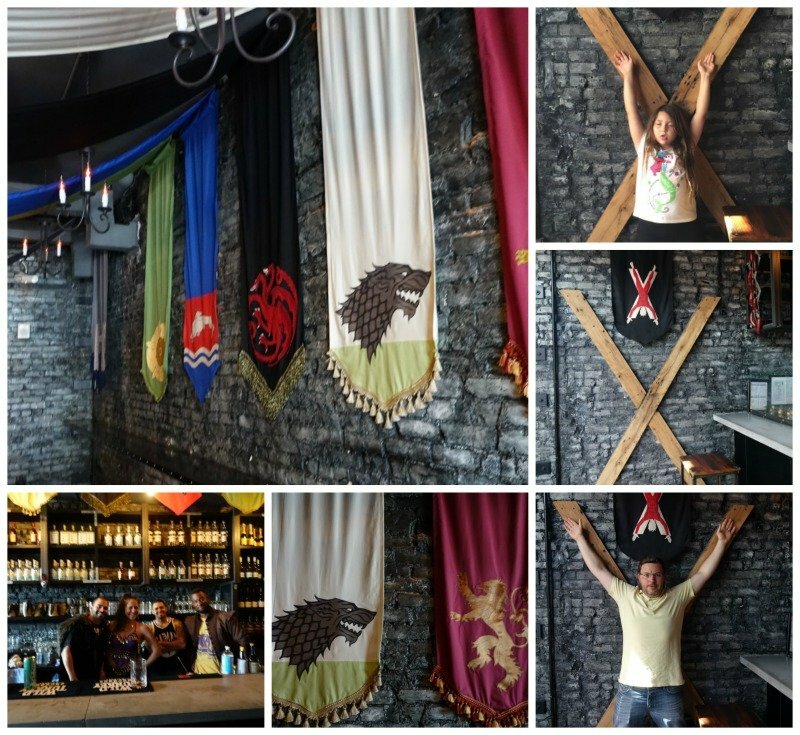 The Game of Thrones comes alive in this bar. What an exciting place to head to in the weekend. Yeah, they kids really liked it. It was definitely a highlight for our D.C trip. Looks like a great place for GoT fans and your family surely had an amazing time there! Oh yeah, even the kids want to go back.